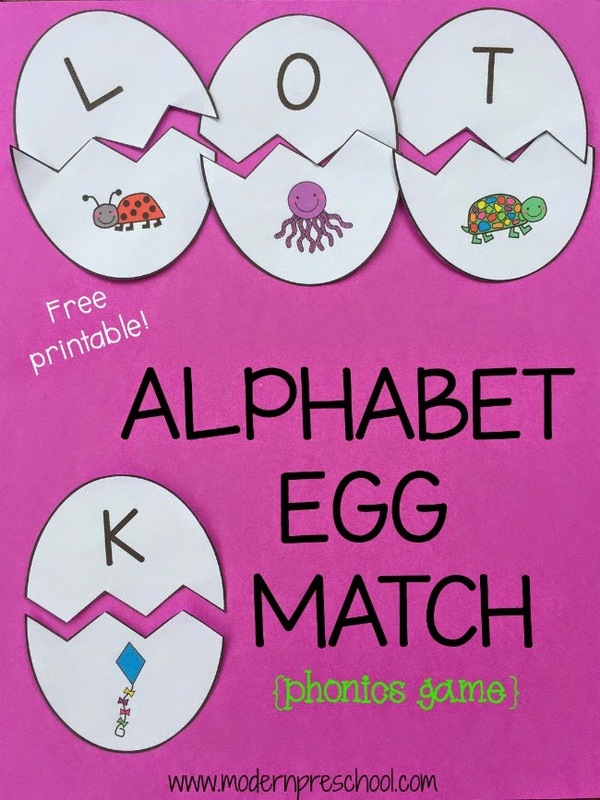 Download the FREE PRINTABLE EGG MATCHING GAME at the link at the end of the post. The printable game includes 26 “cracked” eggs. On the top of each egg is a letter of the alphabet and on the bottom is a picture of something that begins with the letter. Because there are 26 eggs, adding all of the eggs to the game at first may be confusing or a little overwhelming. Instead, choose 3-5 eggs for your child to practice matching. As the matching gets easier, add more eggs into the game. The goal is to build confidence without frustration! For younger learners (who may not know their letters and sounds yet), print out 2 copies of the game. Only cut one set out. 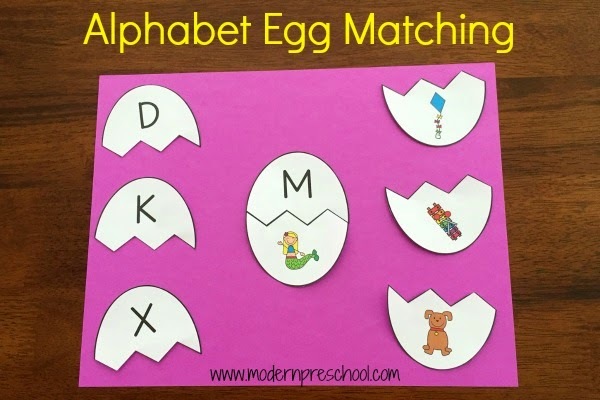 Let your child match the letters and pictures to the eggs on the second set that have not been cut apart. Talk about the letters and the sounds that the letters make. Name each picture as it is matched too! When your child has mastered matching all 26 eggs, change up the game! Egg Concentration – For older kids who are up to even more of a challenge, print out the eggs and then cut them apart. Glue the top halves with the letters to one colored piece of paper. Glue the bottoms with the pictures to a different colored paper. Cut the tops and bottoms out again. Turn all the egg pieces over so the letters and pictures are facing down on a table. Each player picks one top and one bottom during each turn to try to make a correct match. If the player makes a match, go again! This is a fun way to turn the game into a game for the whole family! This game can easily be stored in a ziploc bag or pencil pouch to be played again and again! 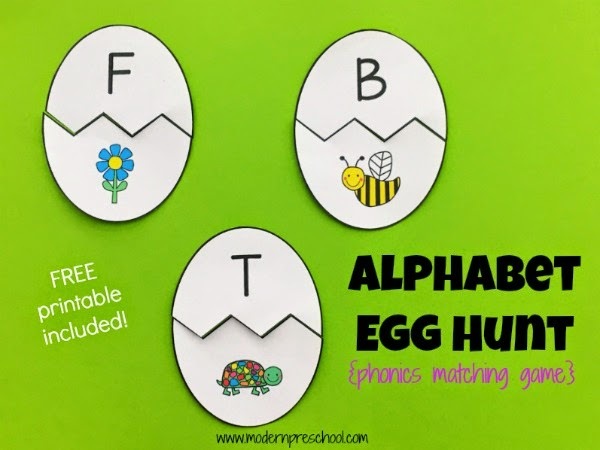 Print the INITIAL SOUND EGG ALPHABET MATCHING GAME PRINTABLE now! Printable busy bags make life easier in the classroom and at home! Check out my other printables and learning activities! Eggs–how perfect for Easter. Thank you for coming to the Inspire Me Monday Linky Party on Monday. I'm Janice, one of your hostesses. What a great idea! Thanks so much for sharing at Motivational Monday! Hope you will link up again tonight. I stumbled across your blog while searching on Pinterest for ideas to teach my daughter her letters. Thank you for all of the wonderful activities and ideas! I cannot wait to start using these with my 4-year-old! She saw me looking at the activities and said, “Mommy can I play with those letters too?” We are really excited!! Thank you! I’ll be using your AWESOME egg alphabet today with my early literacy preschool group 🙂 So colourful, I know they’re going to love it. Yay! I’m so glad the set was helpful!